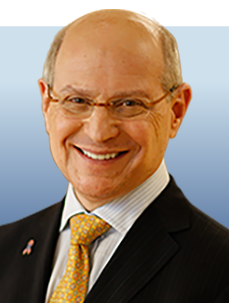 Larry Norton, MD, is deputy physician-in-chief for breast cancer programs and medical director of the Evelyn H. Lauder Breast Center at Memorial Sloan Kettering Cancer Center. Developed an approach to therapy called "dose density" or "sequential dose density," a more effective way of using anticancer drugs based on mathematical modeling. Collaborated with Joan Massagué, PhD, a colleague at Memorial Sloan Kettering, to explore the tendency of tumor cells, upon circulating throughout the body, to return to the original tumor site. Called "self-dubbing," the phenomenon explains why cancer develops in the tumor’s original location, even after the entire tumor is removed. Currently researching the tumor microenvironment, particularly its effect on the immune system. Formerly chaired the Breast Committee of the Cancer and Leukemia Group B of the National Cancer Institute (NCI). Served as President of the American Society of Clinical Oncology from 2001 to 2002 and was appointed by President Clinton to the National Cancer Advisory Board, the Board of Directors of the NCI.